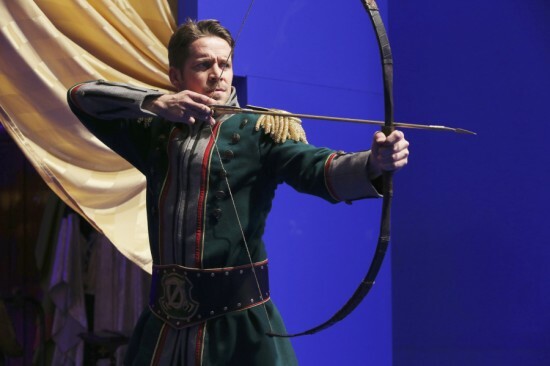 Two-Sentence Summary As flashbacks to Sherwood Forest reveal the origin of Robin Hood and the strength of his relationship with Marian in the past, he faces a difficult choice in the present between what his heart wants and what his sense of honor demands. Unbeknownst to him, though, Marian isn’t who she says she is; she’s actually Zelena in disguise, and she makes a deal with Rumplestiltskin to save his ailing heart in return for a happy ending of her own. My Thoughts Sometimes episodes deviate from the norm and fail. Sometimes they’re a breath of fresh air. “Heart of Gold” was an example of the latter, mainly because of the strength of the actors involved, its thematic connection to the overall arc of this half-season of Once Upon a Time, and one crazy twist. This episode could have felt boring or unnecessary; instead, it captivated me from start to finish. Maybe my love for “Heart Gold” comes from the fact that I’ve loved all versions of the Robin Hood story since I was a little girl. There’s just something about an outlaw with a kind heart and a deep sense of honor that never fails to draw me in (which also explains my love for Killian Jones). And Sean Maguire brings the perfect balance of dashing fairytale spirit and real, grounded moral conflict to this character, whose deep sense of honor might turn out to be his undoing. The Sherwood Forest flashbacks in this episode did a stellar job of giving depth to Robin and Marian’s relationship, which was absolutely necessary given Robin’s choices in the New York City portion of the storyline. For as much as I’ve loved Robin Hood since childhood, I’ve loved Marian even more, so I was thrilled to see Christie Laing capture both Marian’s kindness and her strong spirit in those flashbacks. Whether she was telling Robin she could speak for herself or supporting him in his new life as Robin Hood, this was the Marian I spent hours pretending to be when I was little. I thought Maguire and Laing had a lovely, easy chemistry in those flashbacks that allowed the audience to see what Robin was trying to recapture with Marian in New York. The flashbacks also set up the idea of Robin being the kind of man who chooses to help people in need, sometimes at the expense of his own happiness. I loved his interactions with Will—not just because the world needs more Will Scarlet (Even in this episode I was left wanting more.) but because it showed just how big Robin’s heart is. When Will discovered the bottle after Robin had gone, I was surprised by how emotional I became. Robin is an incredibly selfless character, which in many ways makes him the perfect match for Regina. She spent much of her life devoted to her own selfish goal of vengeance, so I think loving a man like Robin helped her become more selfless. In the flashbacks, Robin sacrificed his own safety and happiness to help someone who was vulnerable. That same kind of sacrifice was put in front of Regina at the end of the episode, and I really believe she’ll make the choice Robin would want her to make (but more on that later!). Not only did the flashbacks finally give Robin Hood a solid backstory (and cleverly explain the use of a different actor as Robin in Season Two), they helped every choice Robin made in New York feel true who he is as a character. I loved all of the fun nods to the show’s past in New York—from the use of Neal’s apartment to Walsh’s furniture store (appropriately named “Wizard of Oak” and containing at least one hidden Mickey). I’m a sucker for moments that show the writers are really trying in terms of continuity, so this episode was all kinds of fun for me. And all of the fish-out-of-water stuff served a larger purpose; it reminded the audience that Robin believes Marian has absolutely no knowledge of how to live in the Land Without Magic. To leave Marian and return to Regina would mean leaving the family he believes needs him in this new world, and we know from the flashbacks that Robin’s code is about giving up his own desires in order to help those he feels are in need. While it’s honorable for Robin to want to make things right with Marian and be the man he thinks she needs, it’s not necessarily the right choice. It broke my heart to see him so devastated thinking about Regina. (Although I’ll take the heartbreak if it means more angst-driven shower scenes because I am not above admitting that an attractive actor is attractive—and Maguire is a handsome man.) It also made me question whether or not the “honorable” thing is always the “right” thing to do. I can admire Robin’s desire to honor his vows while still thinking it would be better for everyone if he stopped caring so much about being honorable and instead cared more about being truthful to himself and his wife about what he really wants. Robin is in an impossible situation and has been for a long time. But he did make the choice to stay with Marian, and I think every single viewer will have their own opinion on that choice. I’m more interested in the thematic ties between Robin’s story and the others we’ve seen this half-season than moralizing about his story. This episode specifically dealt with the idea that people or situations beyond your control can put you on a certain path, but you are the one who chooses to stay on that path or walk away from it. You can choose to hold onto things that keep you (and often those around you) from being truly happy, or you can choose another way. For Robin, he was thrown into a mess when Emma brought Marian back, but he ultimately chose to stay with her out of a sense of duty that he is still holding onto, even when he knows this isn’t where his heart wants to be. That same theme of choosing to stay on the path you were placed on was evident from the episode’s first scene with Emma and her parents. Snow and Charming may have been manipulated into visiting the Apprentice, and he may have been manipulated into telling them to sacrifice the soul of Maleficent’s child. However, they chose to follow through with that plan, they chose to lie to Emma about it, and they chose even before all of that happened to hold onto their fear of Emma’s potential darkness instead of believing in her equal potential for goodness. And Emma has every right to still be upset about it. (It’s only been a few hours since she found out, after all.) I thought Jennifer Morrison was incredible in using her very limited screen time to show just how devastated Emma was by what her parents did, specifically their choice to take away her agency and that of another innocent soul, too. And now that Emma feels she’s been put on a certain path, she’s going to need to believe she can choose what do about it. And that starts with choosing to eventually let go of her anger, no matter how understandable it may be. I’ve loved that this half-season of Once Upon a Time has been about characters looking for an Author to change their story, while every single episode has emphasized the fact that our choices are actually what determine our ability to be happy. Most of those choices involve letting go of who we were in the past. And there’s no better example of someone unable to let go than Zelena. Her inability to move beyond her envy has defined her for most of her life, and it continued in this episode from the moment she made her triumphant return. Is there anything better than a plot twist that leaves you clapping on your couch? That’s exactly what happened with the Marian/Zelena twist in this episode. Watching it all come together when she entered Rumplestiltskin’s hospital room was nothing short of pure entertainment at its finest. There were times during Season 3B that Rebecca Mader’s scenery-chewing started to be a little much for me, but this was the perfect way to use her. Zelena is better in smaller doses than as the main villain. It allows Mader’s gleefully evil style to feel fun instead of overwhelming. And it was so fun to watch her work her magic in this episode. Sometimes you can just feel how much an actor loves the part they’re playing, and that’s exactly what I felt watching Mader as she leaned over Robert Carlyle in that hospital bed. You can tell she loves her job, and that kind of enjoyment and enthusiasm is infectious, especially after being away from the character for so long. Zelena is straight-up crazy, and that has always worked so well against the cold, calculated evil of Rumplestiltskin. She’s one of the few people he seems genuinely afraid of—not just because she killed his son but because he can’t read her like he can read almost everyone else. And I thought it was such a smart choice to have her be the one he ultimately needs to rely on in order to live, especially given the fact that he “killed” her in Season Three. I always thought Zelena’s death was anticlimactic for a character as dramatic as she was, so it was fitting that the real story was as over-the-top insane as she is. But for as crazy as the story was, I liked that it actually fit in with the show’s plot almost perfectly. It made sense and didn’t cause too many plot holes for the sake of shock value. (My only thought along those lines was about her interactions with Ingrid’s magic: Was it really worth not exposing her true identity to have her life be put in jeopardy so many times at Ingrid’s hands? And one other minor quibble: What did Robin think Marian was doing in the hospital room for so long?) Zelena’s return also showed once again that sometimes the choices we make because we feel they’re the right thing to do (such as Emma choosing to save Marian and bring her back despite knowing it would cause problems) can have dangerous consequences. All magic comes with a price, and so do all choices. Zelena also made a choice—to once again want more than what she has. Zelena and Rumplestiltskin are such great foils for one another because their personalities are so different, but their motivations are generally the same: They always want more. Zelena wants her own happy ending instead of just taking away her sister’s, and she knows how to get it: by forcing Rumplestiltskin into a deal because she has the elixir that can save his life. It seems Rumplestiltskin wasn’t just all talk when he said he didn’t have much time to get the Author to give villains happy endings. His desperation is that of a dying man whose darkness and bad choices have finally caught up with him. He’s paying the physical price for his darkness, and I think that’s a cool twist: Darkness doesn’t just destroy your heart metaphorically; it destroys it physically. And from what I gathered in this episode, he isn’t really trying to get a happy ending for himself anymore; he’s trying to get the Author to give villains happiness so Zelena will uphold her end of the deal. And that’s all because he doesn’t believe he’d know what to do with a happy ending if he got one. The scene between Robin and Rumplestiltskin outside the hospital was wonderful, and it was all because Carlyle brings such humanity to Rumplestiltskin. It was interesting to see him differentiate between Neal and Bae, admitting that Neal was a reminder of the fact that he had happiness with Bae and let go of it because he always wanted more. That’s his greatest flaw: being unable to let go of his addiction to power and choose to step off the path becoming the Dark One put him on. We saw in Season One’s “Skin Deep” that if he really wanted to let go and let love in, True Love’s Kiss could have broken his curse at any point. But he never made the choice to allow love to be enough. And it was devastating to see this character have such self-awareness but remain hopeless. He knows he’s a monster, and he chooses to stay a monster because he has no faith in himself to be better. Hopeless is the root of all evil on Once Upon a Time, and no character is more hopeless than Rumplestiltskin. What’s always been fascinating about Rumplestiltskin is the way he can be so sincere one moment and so manipulative in the next breath. It disgusted me to think that he knowingly left Robin and little Roland with an unstable, lethal villain like Zelena. But he knew he could use that for leverage later, which he’s now doing with Regina. Lana Parrilla was heartbreaking during Regina’s phone conversation with Zelena. But for as much as it hurt to watch her discover Robin is in danger, it filled me with such pride to see her refuse to let Rumplestiltskin use that to break her. Rumplestiltskin wants Regina to help him manipulate Emma the way he once manipulated her, but he underestimated Regina’s growth once again. While Regina didn’t make a clear decision at the end of the episode, she wasn’t immediately willing to destroy Emma’s heart to get her happy ending. That moment of standing up for Emma was about Regina reclaiming the goodness she lost when she let herself follow Rumplestiltskin down the path to darkness. While Rumplestiltskin manipulated her, Regina’s choices and her decision to hold onto her anger kept her on that dark path. And only Regina could choose a new path by letting go of her selfish anger. That moment—of Regina recognizing the monster Rumplestiltskin helped her become and choosing to be better than that monster—was such an important moment in Regina’s journey toward becoming a better person. It was Regina selflessly choosing someone else over her own happiness because she knew it was the right thing to do. It was Regina knowing what darkness did to her and not wanting that fate for Emma. And it was Regina standing up to a man who manipulated her for his own gain and refusing to let him do the same to another woman. While it was a moment about Emma and Regina’s friendship (which I love seeing develop in these important ways—give me all the female friendships! ), it was more about Regina’s sense of self. It was about Regina acknowledging that she doesn’t want to hurt people anymore, even if it can get her what he wants. And Parrilla played that powerful moment with the intensity it deserved. I know that she could turn around and choose to help Rumplestiltskin next week, but I’m feeling hopeful that she’s going to make the selfless choice instead. For a show filled with magical solutions to problems and Authors that can control actions, Once Upon a Time has always been a show about choice and self-definition. We might not always choose the paths we end up on, but we choose what to do once we get on those paths. And I’m so excited to see what choices are made and what new paths are taken by all of these characters as the rest of Season Four plays out. Look, it’s ok to admit when an episode of a show you love isn’t so great. This episode was so wholly underwhelming and viewers agreed – the episode hit a series low in ratings. That’s totally fine if you didn’t enjoy this episode; I can understand why. But I enjoyed it. And to be honest, I don’t appreciate the implication that I don’t want to admit when an episode of a show isn’t good. I’ll call a spade a spade when I don’t like something. But I liked this episode. We all have different opinions on TV; that’s what makes talking about it fun. Trying to act like one opinion is the correct one ruins the fun for everyone. I agree with you Katie, it was an amazing episode! Watching the episode, I knew some people wouldn’t like it so I totally understand people who think it was disappointing compared to what we expected after two weeks but I don’t think it was boring to watch! This is actually one of my more favorite episodes from 4B which has been a bit of a disappointment for me thus far. I’ve never really been a huge fan of Robin, but after last night I definitely was. The acting by Robert Caryle was awesome, Zelena was just ridiculous and crazy and it was fascinating to watch, and I genuinely felt terrible for pretty much every body this episode. (Besides the crazy witch). I feel like there are a lot of plot holes that aren’t ever going to get dealt with – and as someone who really doesn’t like plot holes, it’s going to drive me a bit batty – so I’ll have to try and overlook them because the episode was pretty great. I’ll be curious to see what Regina’s reaction to Rumple’s “deal” will be – hopefully she throws a flame ball at him. Loved! I get why they did what they did. I don’t condone it, and I certainly think they were a bit awful for lying for so long about it, and it certainly doesn’t mean they should be forgiven…but Charming has been a bit of a doormat lately when it comes to Snow and Emma, so it felt nice to have him act less like David and more like the Prince there in that moment with his strong admittance that him and Snow are human. They made a mistake because they’re parents – willing to do what it took to ensure their child’s future – and it cast them in a really shady area, but they’ve attempted to shape their entire lives to fix that one decision. Usually I’m not a huge fan of episodes that are this centric and exclude so many of the other main characters, however, I really loved this episode. Sean really did such a good job that I didn’t even really miss the other character (at least not the way I though I would). I really appreciated Emma’s frustration with the Charmings and I was still kinda frustrated as well. I didn’t get round to commenting on the last episode but while I understand that the Charmings are human, and I even respect that they could realize how wrong they were, I found myself incredibly irked by the way they chose to rectify what they’d done. They stole a woman’s baby as she begged for mercy, stuffed it with evil and lost it to a portal, and their idea of setting things right was to raise their own child right (because they could as she hadn’t be stolen, stuffed an lost), and make plans to preserve their own image of purity throughout their kingdom. The fact that they didn’t try to make things right with Maleficent genuinely annoyed me. They could’ve gone to Rumple (or Merlin if he is wandering around the EF), made a deal and had him at least find the realm the baby was lost to and then found some type of way to try and retrieve it. When you hurt someone, you try to redeem yourself by fixing things with the person you’ve hurt, not by simply doing things to make yourself feel better so you can sleep better at night. This episode was a roller coaster for me with my feelings regarding Rumple. At first I was annoyed by him holding Regina prisoner and basically telling her he’d make sure she doesn’t get her happy ending. Then the whole time in NY, his heart problem and his urgency for needing the cure etc made me sympathize with everything he’s done lately, but then when we got back to SB and he was trying to manipulate Regina into helping him corrupt Emma and putting Robin’s life on the line, and I was like ok, you’re an evil imp again. I don’t know why he doesn’t just team up with Maleficent, Regina and Emma to take Zelena down and get the cure, outside of her appearance change, I don’t think she has any power outside of SB and even so, if she can take magic with her, I don’t see why they can’t. I find his whole plan to be slightly illogical. He could have told Robin that Marian is Zelena, told him to steal the potion back from Zelena and taken him back to SB with them, Regina would have easily let them all in to ensure his and Roland’s safety and then they could have all worked together to attempt to achieve their happy endings (and if she refused he could have threatened Robin in SB). Leaving him out there with that psycho made no sense, because should Zelena’s unpredictable self harm/kill him out there, not only is there is NO WAY Regina would lift a finger to help Rumple, she’d direct all her energy and fury into ending him for playing a part in it. I actually wasn’t that surprised by Zelena popping back up. Her death in S3 didn’t seem final at all and her going into the portal and Emma and Killian conveniently bringing Marian (of all ppl) back with them always seemed a little too convenient. I love/hate having her back. I LOVE her character and she really is deliciously evil, I enjoyed that hospital scene WAYYYY more than I should have. I think she will definitely add an interesting dynamic and may really test Regina’s new resolve as a hero. The hate part comes from her main goal in life being to destroy Regina for no reason other than the fact that their abusive, magic wielding, power hungry, psycho witch mother chose to abandon Zelena and keep Regina. I loved seeing Robin’s backstory and him adjusting to life in NY, his character and Sean’s performance were really strong and carried the episode well. I’m gonna go ahead and say that either he was ‘potioned’ or he figured out that Marian isn’t Marian, and is playing along to pacify her to keep Roland and himself safe until he can find a way out. Robin mentioned that she didn’t seem like herself or seemed like a stranger. Robin also noticed that when he asked her a question regarding their old life she didn’t/couldn’t answer and then in his convo with Gold they mentioned both that magical items work in this world and Zelena not being a fool. I don’t believe he would genuinely be able to let Regina go so easily especially He was reluctant to leave a couple days prior and as Zelena had said that there was something strong blocking her from getting him to fall in love with her earlier THAT DAY (or within a couple days later). Also at some point, he will (if he hasn’t already) see the necklace and since he used to use it, he’ll know exactly what it is and what it does. Regina broke my heart at the end when she was talking to Zelena, she looked/sounded so hurt. Like I said earlier, I do wonder of Zelena will be the last straw and pull the EQ out of her momentarily, which might have been what her dream was hinting at. I loved that Regina wasn’t willing to let Rumple make Emma a monster like he did to her and I’m already sure she’ll find a way around Rumple’s ultimatum and save both Emma and Robin. I think she’s both grown enough and is also angry enough to not help Rumple. Based on next week’s promo I’m starting to wonder if Cruella will get her happy ending, both Regina and Emma are powerful, they’re both already pretty angry at their own respective situations and now Cruella is threatening to kill/shoot Henry. I just don’t see it ending well for her. I lean toward the Robin was “potioned” (or, magically whammied) side. There’s a precedent in Disney’s Little Mermaid with Ursula and Eric. Or, maybe I just want him to have been magically whammied. I am under the assumption that Rumple already used the potion, or he wouldnt have been able to leave the hospital room, and the only reason he didnt tell Robin about Zelena was so, as Katie pointed out, he could use it against Regina later. It does make me curious why Rumple would have bothered with that whole “chase after your happy ending and hold on to it” speech if he was trying to encourage Robin to go back to Regina? Or was he trying to send him back to Marian? That scene was the one that I found the most confusing. I don’t think he’s used the potion yet, maybe she gave him enough to get out of hospital but not enough to fully cure him. Zelena wouldn’t have given it to him before getting what she wants and Rumple wouldn’t be working with her if she didn’t have something he desperately needed (she killed his son). I was saying it would have made more sense to tell Robin, let him steal back the potion in exchange for taking him back to SB, and then Rumple could have used him against Regina himself and had more control over the situation. Instead, he left him with Zelena who can be quite unpredictable and wicked. If for some reason Zelena changes her mind about her agreement with Rumple (or kills Robin), Rumple loses his bargaining chip. I’m not fully sure about the convo between Rumple and Robin either. I have to watch it again later but I almost feel like he was hinting at something & I think Robin caught on to whatever it was. I don’t see Robin genuinely giving up on he and Regina so easily within like less than 48hrs of leaving her which is basically when this episode takes place, so I feel like either he knows it’s not Marian (either by all the things he noticed were off with her, or Rumple said or slipped him something that tipped him off) or he’s been drugged by Zelena. I liked this episode a lot. I’ve been wanting Robin backstory since he was revealed to be the man with the lion tattoo. It’s been a long time coming. I’m bummed that a large portion of the fandom chose to boycott the episode due to a dislike of Robin. We finally got a look at why he makes the choices he does. Actions like this will make it so that the writers don’t take risks on other character’s fairybacks. Frankly, I’d rather see an episode like this that gives us some much needed backstory on a character who has become increasingly important to Regina’s arc progression than ANOTHER fairyback to the Enchanted Forest featuring Snowing against Regina. I hope this won’t deter the writers from giving us backstory on other characters who desperately need fleshing out, like Will Scarlett and Belle. I loved the twist with Zelena (I had actually started to wonder about something like this when set pictures of Rebecca Mader began appearing on tumblr a few weeks ago). Mader is such a breath of fresh air with her maniacal glee and scenery-chewing. I’ve been mostly underwhelmed with the villains this half-season and Mader just storms back on to the scene, bringing chaos and genuine threat to the story. It’s so much momentum that I was almost disappointed to find out we’re getting a Cruella centric episode next week. Mader’s such a force in this episode that it really shows how little motivation the authors have given us to care about the Queens of Darkness who started this half-season. Ursula’s backstory was lovely but then she was left. Maleficient’s backstory was tragic, but she honestly doesn’t feel like much of a threat to the heroes. We’ve barely seen her interact with anyone outside the Villain Circle. It’s not like Zelena, who is so hell-bent on acheiving her happy ending that she was willing to erase Regina from existence, who is still actively preventing Regina from getting her happy ending by separating her from Robin and torturing her with that knowledge. We know even less about Cruella, who is fantastic comic relief but nothing else at this point. By this point last year, we knew exactly what Zelena wanted and the threat she posed. She may have been camping it up quite a bit, but at least the danger was real. The throughline of the season was clear–Zelena needed Snowing’s baby to make a time travel spell possible so that she could erase Regina from existence and have the life she thought she deserved. Emma was determined to return to NYC, Zelena wanted to remove Emma’s powers by having Hook kiss her, and Regina was learning to believe in love again. The stakes were clear; the plot was clear. What exactly is the throughline here? It feels like the stakes have been raised by reintroducing Zelena and now the writers are scrambling to prove that this other villain they’ve brought in is also a threat. I’m hoping that Cruella’s backstory next week will give us more reason to care about the QoD’s plans, but for now, the Villain’s Circle is overcrowded much like in the lows of Season 2’s back half. Who exactly is our big bad? Rumple? Zelena? The QoD? Is Cora going to make a reappearance? They all want the author but maybe Rumple is just trying to live up to his end of the deal? And yet he seems to crave power just as much as the others so is he really siding with Zelena or playing her until the time is right? How exactly are the QoDs planning to turn Emma dark? Why do they still need Emma when they have the author? What do they all want from their happy endings? What does Zelena want? What does Cruella want? What does Rumple want? How will these happy endings negatively affect anyone outside of Emma/Regina? As much as I love when the writers flesh out other characters, I hope they dial it back next year with the number of villains in play, because it’s hard to care when this many wheels are spinning. Im with you fangirl, I need a scorecard to keep track of everyone at this point! I am starting to think that maybe this muddled mess of motives is intentional? The heroes are all getting knocked down a few pegs, the villians are all trying to move up, and now we just have a big hodgepodge of grey in the middle and and us viewers dont know up from down anymore. Lets hope they are breaking everyone down to make their ultimate choices that much more satisfying in the end. Discussion time — happy dance! Happy dance! While Charming’s “we’re human” point was valid, I was so glad to hear Emma point out that Snow and Charming were responsible for their own choices. The Author may have put them on the path, but they chose to keep walking it. One of things that I’ve always appreciated about this show is the emphasis on choice. Everyone has a difficult background — heroes and villains alike. The difference is in how they deal with it. Zelena continues to choose envy over and over again despite the fact that the choice never ends well. Rumple always chooses power, and now he’s paying the price (dearie). Poor Emma; she was trying to embrace the “savior” identity — even when it was difficult and didn’t give her a day off — and now she feels like that identity was never her choice and came at the expense of someone else. Hopefully she’ll remember her own “you have to push back and say this is who I am” speech. I’m sure a hug (or two or three) from Hook will help. I’m still a little conflicted about the Marian-Zelena twist, so I’m curious to read other people’s reaction. Part of me loved the awesomeness of it. On a certain level it makes sense. (Although, seriously, wouldn’t Zelena just go through the portal immediately rather than waiting on and then stalking Hook and Emma? Plus if she had taken over Marian’s role earlier, this would account for the differing versions of Marian’s fate.) This is exactly the type of revenge Zelena would seek. And what’s going to happen when Zelena and Cruella are in the same room together? Part of my brain was quietly saying “cop out.” I’ve been wondering how they would resolve the Marian conundrum — and this avoids the messiness: it’s never been Marian. Problem solved! However, this is when I decide to just ride the fun train and tell that small voice to shut up, Zelena’s going to make for great angst. Plus she’s just so much fun . . . it’s nice to see someone give Rumple a run for his money. And it was a great twist. And yes, I laughed harder than was probably necessary at “Marian’s” listing of the symptoms the “potion” would cure and the assurance that it was non-drowsy. Oh, and yes — more Will. Always, more Will. Poor Regina. I think what makes this such a conundrum is that it’s not just about Emma’s soul versus Regina’s happiness. Standing up for Emma means that’s Robin and Roland are in danger being with Zelena. I wouldn’t be surprised (or disappointed) if Regina decided to help Gold simply because she might see it as the best way to save everyone. She could save Robin and Roland and then help Emma by being on the inside with Gold. I also keep hoping that we’ll see the broom walking through Storybrooke and/or working at Granny’s. Being a lover of fantasy has made me nothing if not patient. Hell, if you read GoT you can go an entire 1000 pages without finding out what the heck is going on with your favorite character (or if they are even still alive). And lets just throw a 5-10 year hiatus on top of that. I’m good with a few weeks. I am with you in thinking that Regina is going to help Gold. I definitely took that look at the very end of episode as her reconsidering her initial choice, but only because its the only way she can have any power to help in this situation. If she doesnt agree, she’s just going to be stuck in her vault unable to help anybody. The fact that her FIRST gut reaction was to protect Emma is all we as an audience needed to see. I dont think the world could handle Zelena and Cruella in a room together!! I enjoyed everything about the episode except the totally cheap way they killed off Marion. Since last fall I’ve been saying that the trope, “You can’t cheat death” meant that Marion would die, and free up Robin to go back to Regina with his honor intact. I was HOPING they would let her die heroically, saving Henry or her own son or Emma or someone. Not a cheap, ‘hey, kill her while she’s unconscious in the forest and no one knows she’s dead’ way. I would think the showrunners would find a better way of bringing Zelena back without dumping all over Marion’s character. She’s just been a meatpuppet all along? Very poor artistry, boys. I just have to comment because I’ve never heard the term meat puppet before, but what a glorious term for her. My favorite scenes in this episode were the first and last scenes – I loved seeing Emma call out her parents on what they did – she’s still so upset, and I loved the way her voice was breaking when she was talking to them – great acting by Jennifer Morrison. And I loved the last scene with Regina, Rumple and Zelena – again I thought Lana Parilla was excellent in this scene, Rumple continues to try and manipulate her (he’s not even trying to hide it anymore) and I can’t wait to see what she decides. I liked seeing Marian and Robin in the flash backs as a happily married couple, he’s talked about how much he loved her but this was the first time we’ve really seen them together. As villains go Zelena is probably my least favorite, but I have to say I loved all her scenes in New York, that woman is so crazy even Rumple is afraid of her. The scenes in the hospital were excellent, Carlyle and Mader have great chemistry. I’m still not a huge Robin fan after this ep, but I do like him more than I did before. This is easily the most I have ever liked Zelena. Her scenes with Rumple and her phone call with Regina were so entertaining to watch and her complete dedication to destroying Regina’s happy ending is almost impressive, for lack of a better word. While I understand why it was necessary for plot purposes and even consistent with who Robin is as a character, I can’t help but be frustrated at his choice to stay with Marian. I’m slightly less bothered than I could have been now that I know it’s not actually Marian but to me, romantically staying with someone who you no longer love in that way isn’t the honorable thing to do and just cheats both of them out of a true happy ending. But since it’s actually Zelena, I’ll be interested to see how it plays out for the reminder of the season and beyond if this plot continues in any way. I loved the little bits of Emma and Regina we saw in this episode. Emma was so hurt and betrayed by her parents, which she should be, but for me, the best part was the sadness that her goodness was a result of another child getting their choice for goodness and their potential happy ending taken away. Choice is so important to Emma, not just for herself, but for everyone around her. Of all the characters on this show, she’s the one who is the most driven to define who she is. Even when the burden of being the savior is overwhelming, she recognizes that she chooses to take on that role. So to think of an innocent child being deprived of that choice for her benefit has to fill her with guilt. She never asked for it but it’s yet another burden she’ll carry until it can be made right. Finally, I don’t have enough words to describe how much I enjoyed Regina standing up for Emma. Regina chose to do the right thing. She chose to prevent another person from being used by Rumple for his own benefit. I would love for her to stop having to actively make decisions that are the right thing to do but at the expense of her perceived chance at true love/a happy ending at some point because I’m getting a little tired of it for her but I’ll never stop being proud that she consistently chooses to do good. I enjoyed this episode and thought it set up some interesting storylines. I loved the hospital scene between Rumple and Zelena. Zelena was so gleefully crazy tormenting Rumple and he was perhaps at his most vulnerable, and vulnerability is rare with Rumple. Plus the thought of her trailing Hook and Emma through the EF in the season 3 finale just makes me laugh. I really loved the Marian we saw in the EF and her relationship with Robin. I’m glad we got some follow-up on the situation with Emma and her parents. I’d have loved a little more interaction than what we got, but I was glad they didn’t drop the story until next week. The thing about their conversation that struck me the most was Emma stating that they may have been manipulated but they still did what they did. That line seemed to be an almost direct contrast to Regina stating later in the episode that Rumple manipulated her. I really think we are going to hear more about manipulation vs. choice in the next few episodes. Fantastic write-up as always! I LOVED this episode even if it did feel a little weird to have the focus so firmly on Robin & Marian, two characters previously relegated to the “second tier” in most if not all of their previous appearances on OUAT. But the writers seem committed to the idea of Robin and Regina as a couple, and I love that 1) b/c I think Sean Maguire is a DISH and 2) Maguire and Parrilla have fantastic on-screen chemistry. And 3) I am a TOTAL SUCKER for a royal falling in love with a “peasant” or subject “beneath” them socially and working to overcome that difference. 🙂 This episode was SO LONG OVERDUE…I wish we could’ve gotten some of this story earlier, but it was done so well and thoroughly now I can’t really complain. And I was THRILLED with the way the Zelena/Marian thing played out. At the end of S3 I thought Zelena’s “death” was a little bit of a cop-out, and the way the smoke/dust from her evaporation made a beeline for that time portal was more than a little shady. I remember Tumblr theories from over six months ago now speculating that Marian was a plant…and I loved how that played out. Because Robin HAD moved on and it seemed too awful that the writers would say Regina killed Marian and then NEVER ADDRESS THAT between her and Robin…and here they magicked their way out of that corner. Great review Katie! This was another episode that I enjoyed, but its not quite sparking a bunch of in depth thoughts in me, so I warn you there is nothing much of substance below. I kept wondering why on earth Rumple would honor his deal with Zelena after he already got what he wanted (the potion) since Zelena has no leverage over him anymore, but the fact that you pointed out that Rumple is using Zelena to get to Regina makes perfect sense. Ugh Rumple you manipulative butthead. But I am curious if the potion was only a temporary fix. Rumple seemed to make it sound like he is still on borrowed time during his chat with unconscious Belle. Speaking of Rumple, after everything he has put our characters through lately I was relishing every moment Zelena was tormenting him (slightly morbid, but the truth). Her look of glee when he flatlined in the hospital was perfect, just like pretty much that whole scene was perfect. With all of the morality and guilt floating around this season it was nice to just see a villain that was actually enjoying their villainy. I really enjoyed the flashback scenes in this episode. It really had the feeling of a Season 1 episode, and I mean that in the best possible way. It was great to see more of Marian, but it also made it that much harder to swallow that she had such an undignified death. They could have at least had her “discover” Zelena during the whole adventure, and Zelena had to kill her to keep her quiet. Dying trying to warn someone would have been way more honorable than just being murdered while unconscious. I am usually pretty forgiving when it comes to this show, but this one really irked me. I think they should have taken the few extra minutes to do it right. The way the author was acting at the beginning of this ep makes it seem like he is quite addicted to his role. I am curious what would make him so obsessed with meddling with other’s lives. What is he getting out of it? I loved the little detail of the portal to oz opening up and crushing the guard (man when did I get so morbid)? I had no problem with taking a little break from the Charmings (and Hook) this episode. Between the hiatus and the first few episodes of 4B being Robin free I was having a hard time remembering how much Robin was involved with the author plot in 4A, so I am glad to have him back in the mix, even if our list of characters is getting a little overwhelming (and this is even without our Arendale friends). If they decide to bring Sidney back for any reason (I assume he’s running around Storybrooke somewhere after Ingrid let him free) my head just may explode. I just have to laugh at the fact that I usually watch OAUT alone, but my friends and family all know what a huge fan I am of Hook, and the only episodes I have had company while watching during Season 4 is this episode (with my bf), and ‘The Snow Queen’ (with my best friend), which are pretty much the two episodes with the least amount of Hook in them, so the closest people in my life still have no idea what I am talking about. Womp womp. With Regina’s urging, don’t forget. If “Marian” had been able to stay in Storybrooke, I believe she and Robin would have parted ways as a married couple (I wonder how Zelena would have dealt with that . . . or perhaps she faked the lingering spell to drive Regina and Robin apart, just as she was “planning” to step aside). But the spell (or Zelena’s pretense) put the kibbosh on Robin’s chance to be with Regina. And allowing a woman with no experience in the 21st century and a young boy alone in the outer world seems a bit cruel. I can understand why both Robin and Regina decided that he must accompany them. You know, one of my favorite parts about your reviews is how much you enjoy the show and all the intricate parts of it. There are some episodes that are outstanding and some that are meh and some that fall somewhere in the middle. This episode was damn entertaining even if it was a little different than their usual episodes. I admit – the flashback within a flashback wasn’t great – I would have been happier if they spread out this story over two episodes but they made the choice they made and I’m glad to know the information they delivered in this episode. I see a lot of people have issues with plot holes and I just can’t agree with them – the writers have actually done a really good job with filling in most plot holes. I thought their explanation of a different actor playing Robin Hood was cleverly handled here. The problem is that they offer an explanation and people don’t like it. In their world(s) they can make up the rules! What a wild and crazy episode that was! I don’t know if other people knew more of what to expect based on spoilers, but all I knew was what was in the promo, and I have to say I was not looking forward to a Zelena/Oz episode. So I was happy that it was actually a Robin episode, and when Zelena showed up in the hospital room I was practically clapping my hands together with glee. All I could think was “trust these people to rewrite almost a full season with one twist!” The hurried explanation of what had really happened was nutso, messing with my head, but what it really did was make me want to go back and watch every episode since Zelena’s death again. I know that’s really not necessary (maybe just the Marian bits?) but from a showrunner POV that’s not a bad feeling to instill in your viewers. I agree with others that Zelena’s death had seemed rather empty, so it’s not surprising that there was more to her story (although I never imagined this). And I also agree that Marian’s death, inevitable though it had always been, was a bit of a let down/cop out… magicked into dust unconscious on the ground… I liked her enough that I would have liked to see something a bit more dramatic. but *shrug* Who knows if she’s even really gone. At this point of the show I won’t make an assumptions about anything. I felt like maybe this episode might have changed our sense that Rumple was on a path so evil that there was no real way for him to come back from it…? I’m not sure now. I guess maybe I need to rewatch this episode and wait to see how this all plays out, but maybe Rumple isn’t the total bad guy he was looking like? I totally missed that the necklace was the explanation for why Robin changed actor/looks – lol. Very convenient. I’m sure I’ve mentioned before that I’m not a Zelena fan, but boy, she does a good job at what she does. That hospital room performance looked like the most fun she’d had in ages. Now is anyone else really worried about the tiny little hobbit boy? I honestly have this urge after the end of every episode, which is why I find this show so fascinating and fun to watch. For maybe the 10% of plot points that dont fit together perfectly, the other 90% is amazingly well thought out (which is why I never gripe too hard about the misses – nobody is perfect). It is the only show I save on my DVR until it comes out on Netflix so I have them to reference back to. I am pretty sure I have watched every episode of this show in full at least twice, which is unheard of when it comes to a show that is still currently on the air. And this has to be in part why it is one of the most streamed shows on Netflix. I am hoping that the show’s worth to Netflix alone is enough to warrant a couple more seasons. I am slightly worried for poor little dimple faced Roland, but considering Zelena managed an army of flying monkeys, one little human toddler is probably a walk in the park. He is fine until Zelena needs to use him for something. Her needing to use him for something is what I’m worried about!! Yes, I agree. Pretty much every episode of this show makes me want to rewatch everything to see how the new info fits in. And yes, almost everything does fit in. I really appreciate this show’s attention to detail. Almost everything seems to be pre-planned and thought out (thank goodness! or this show would have collapsed under the weight of its own stories by now) which makes it all the more delicious to go back and catch all the little hints that things were not as they seemed. I have no idea if they gave us any hints about Marian’s identity earlier on, but I’m quite happy to watch again and find out. I think the low ratings had a lot to do with the fact that the show had been off the air for two weeks. How are they going to know the quality of the episode, if they had not seen it in the first place? And why would the ratings reflect the opinion of the show’s entire fandom? He may not be a “total bad guy” but he’s going about things the wrong way. His actions are not helping his cause. And he still has to account for his attempted murder of Hook, Pinocchio’s torture, attempt to entrap Emma in that hat and God knows what else during the past season. I realize that many want instant redemption for this guy, but I don’t see it happening. Regina didn’t get instant redemption. Something tells me that Snow and David are going to paying the consequences for their action one way or the other. I actually did enjoy this episode. I felt it picked up the pace more than in previous episodes we’ve seen so far for 4B. And it wasn’t just a filler. But I think what I truly enjoyed about it, was the flashback to the 9 weeks ago scenes in New York. I think those scenes were the most compelling. Were there some plot problems with the episode over all? Yeah, but you expect that with Once. No episode is 100% perfect (save the Captain Swan movie). I did enjoy how self-aware Rumple was in the flashbacks, actually admitting that he didn’t appreciate what was in front of him until it was too late. There’s so much I loved about that scene with Robin outside of the hospital. Rumple is still being selfish, but at least now, there’s a somewhat sympathetic reason for what he’s doing. As opposed to his arc in 4A where everything he did was about himself. So I appreciate that development in regard to his character. Props to Christie Laing for playing fake Marian/crazy Zelena. Her performance reminded me of Colin’s performance earlier in the season where it was him playing Rumple playing Hook. As much as I enjoyed the episode and seeing more of Robin’s backstory, the episode did remind me of a season two episode that was generally considered the worst of the season: Selfless, Brave and True. There were plot problems with that episode and there were plot problems with this episode too, but between Selfless, Brave and True and this episode, I wouldn’t mind a re-watch of this one. Besides the plot similarities, the Marian/Robin/Regina love triangle was basically given the SwanFire/Tamara treatment. Robin and Marian were a thing once, they truly loved each other and the moment Marian came back in the season three finale, Robin felt obligated to continue to be with her even though he had fallen hard for Regina. So, in this scenario: Tamara is Marian, Robin is Neal and Regina is Emma. I’ve never been a fan of Neal, but I can definitely see similarities between the way Neal was written and the way Robin is being portrayed and the way this love triangle arc is playing out. We found out at the end of Selfless, Brave and True that Tamara was evil and the only reason she was with Neal was to get access to Storybrooke. Zelena wants to take Robin away from Regina but finds that she can’t, but she’s going to continue to masquerade as Marian to get him to fall in love with her (if he hasn’t already). I think the only thing missing from the story thus far is a magic bean and a portal. I am sad that we lost Marian, but I’ve also noticed when it comes to first true love’s on this show, they’re never really meant to be big characters. Daniel, Neal, Marian, Milah even — they’re all plot devices. They’re only purpose is to move the plot along and are rarely given full character treatment that other characters get. We got some character development with Neal but his story was mostly tied to Rumple and Emma. Outside of those two relationships, he’s not important. Over all, I did enjoy this episode and will definitely be watching it tomorrow.